I first published this recipe in 2007, on page 156 in Super Natural Cooking - the Sushi Bowl. Looking back at the recipes included in that book, this is one that has remained a personal favorite of mine (top five for sure), and from what many of you have told me, it has long been a favorite for many of you as well. Simply stated, we are talking about a de-constructed sushi roll - brown rice, tofu, avocado, toasted nori and green onions served with a tangy, sweet citrus-soy dressing. 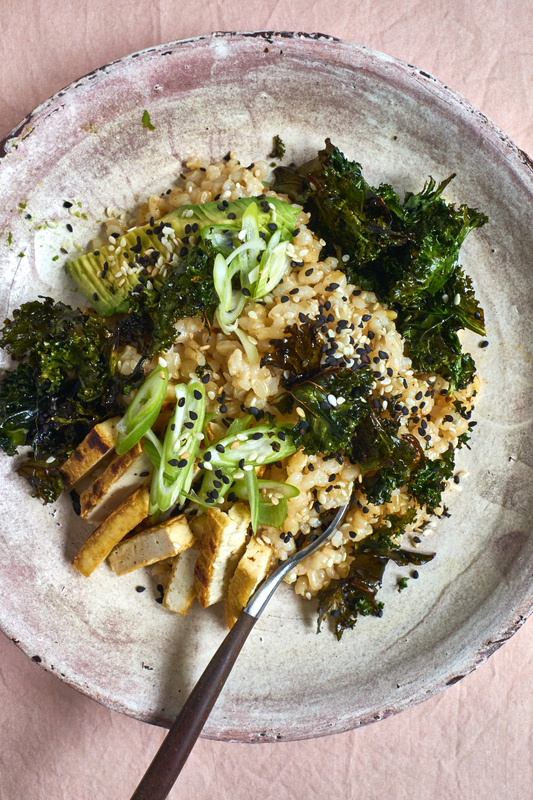 When I don't have toasted nori on hand, I swap in a handful of crushed kale chips. This dressing rules. You do a quick simmer of a bit orange and lemon juice, and then season it with a bit of brown sugar and rice vinegar. I wrote the recipe calling for orange and lemon, but I often make the dressing with grapefruit or blood orange juice, and it is exceptionally good - puckery citrus sweetness coating the grains of rice throughout each sushi bowl. So! If you love avocado rolls, this is a tricked out version, in bowl form. So simple, especially if you have cooked brown rice at the ready. This is the sushi bowl from lunch today, made with kale chips in place of toasted nori. When I originally wrote this recipe, it was conceived as a lazy day way to enjoy my favorite sushi roll ingredients. In an attempt to pre-empt comments related to sushi & bowls, I'll leave you with this. I think there is occasional confusion with the idea of a sushi bowl, because the perception is that sushi is the roll itself. But, as Haruhiko mentions in the comments down below, “Sushi is a term that technically refers to the seasoned rice itself. There’s makizushi, inarizushi, chiraishizushi, etc., and what they have in common is the seasoned rice. You don’t need raw fish for sushi to be sushi." xo Haruhiko! Hope this helps! I've included the instructions for cooking brown rice here, but when I'm pinched for time I just grab for frozen, pre-cooked brown rice (freeze it yourself, or look for it in the freezer section at Whole Foods). Stir in 1/3 cup of the dressing into the rice and add more to taste. 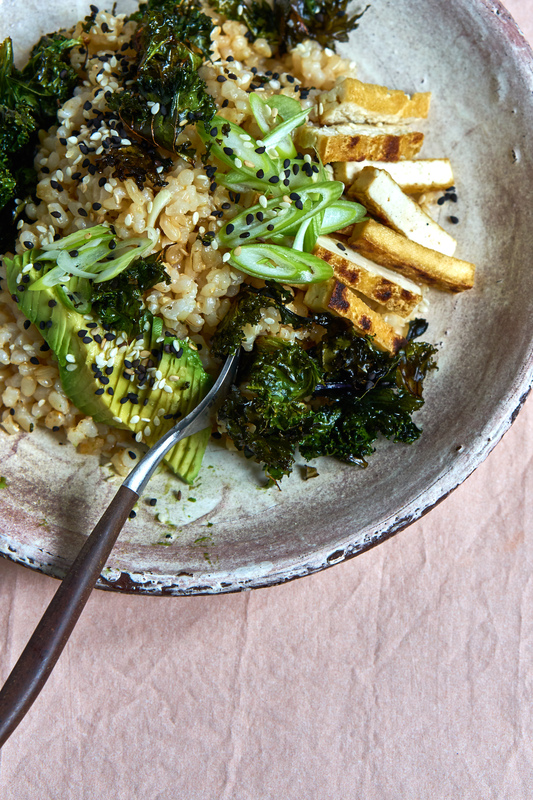 Scoop the rice into individual bowls and top with the toasted nori, green onions, tofu, avocado slices, and a sprinkling of sesame seeds.